Decision makers in Yachting Industry want choices! Now yacht owners, captains, senior crew, agents and management companies find suppliers in multiple ways. Buyers will choose the medium that best suits them at that moment, depending on their profession, knowledge, past experiences, internet access, advertising budget, etc. Do you want to target the Yachting Industry? Does your business provide a service to yacht owners, captains, crew or guests? Then get your yachting business listed for free or advertise with us. 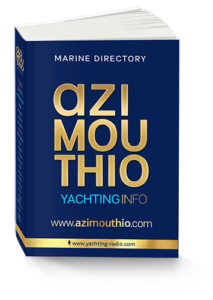 AZIMOUTHIO Yachting Info is the Ultimate free press Marine Directory in the Mediterranean and Middle East, that provides Yachting, Sailing and Shipping information. It is handy, practical with functionally arranged sections for easy search, providing detailed and useful information, regarding professionals, enterprises, marinas as well as useful information concerning Yachting, Sailing and Shipping industry. With over 10.700 companies listed in the AZIMOUTHIO Yachting Info Directory, we have endeavoured to make the Directory as intuitive as possible for users to find easily whatever they search for. It is produced annually in 35.000 issues and it is distributed free to organized Marinas in the Mediterranean (Spain, France, Monaco, Italy, Malta, Slovenia, Croatia, Montenegro, Albania, Greece, Turkey, Cyprus) and Middle East (Lebanon, Jordan, Egypt, Kuwait, Bahrain, Qatar, Saudi Arabia, Oman, Emirates – Abu Dhabi and Dubai), as well as to every Yacht docked. It is also distributed free to all Agencies, Management and Shipping Companies in Greece, Cyprus, Croatia and Emirates.Our aim is to reach annually more and more captains, owners, brokers, shipyards, designers, shipping – management companies, agencies, decision makers and leaders of the yachting industry in the Mediterranean and Middle East. The feedback from our users and advertisers reveals that we are almost there. Well known within the marine industry, AZIMOUTHIO Yachting Info has established its reputation as a respected brand name which captains, crews and marine businesses can trust and access time and time again. Guaranteed by the certification ISO 9001:2008 LLOYDS, for the quality of AZIMOUTHIO Yachting Info Directory and accuracy of the data. Τhe Online Marine (Yachting, Sailing and Shipping) Directory www.azimouthio.com celebrates the third year in vocational-sectoral information provision, through applications that make use of the Internet to display lists of enterprises and professionals. www.azimouthio.com constitutes the website of the advertising platform of AZIMOUTHIO Yachting Info Marine Directory. As part of this platform, the Online Directory www.azimouthio.com, through its smart and versatile search engine, provides detailed information on any kind of search for professionals, enterprises, marinas as well as useful information concerning Yachting, Sailing and Shipping throughout the Mediterranean (Spain, France, Monaco, Italy, Malta, Slovenia, Croatia, Montenegro, Albania, Greece, Turkey, Cyprus) and Middle East (Lebanon, Jordan, Egypt, Kuwait, Bahrain, Qatar, Saudi Arabia, Oman, Emirates – Abu Dhabi and Dubai). With over 10.700 companies listed in www.azimouthio.com, we have endeavoured to make the site as intuitive as possible for visitors to find easily whatever they search for. This includes our classification system that breaks companies into a set range of categories and it moves beyond this to giving search results in list and culminates in a word-recognition search bar, that offers results as words are being typed. Finally, it is worth noting that the Online Marine (Yachting, Sailing and Shipping) Directory www.azimouthio.com regularly updates its information systems and improves the speeds of its operation, which can transmit data at very high frequencies, so that the total of professionals and enterprises will trust the directory for their advertising as well as its visitors will access the content of the website in a fast and reliable manner. Guaranteed by the certification ISO 9001:2008 LLOYDS, for the quality of AZIMOUTHIO Yachting Info Online Directory and accuracy of the data. AZIMOUTHIO Yachting Info App is the latest addition to the advertising platform of AZIMOUTHIO Yachting Info Marine Directory. As part of this platform, the App, through its smart and user-friendly search engine, provides detailed information on professionals, enterprises, marinas as well as useful information concerning Yachting and Shipping throughout the Mediterranean (Spain, France, Monaco, Italy, Malta, Slovenia, Croatia, Montenegro, Albania, Greece, Turkey, Cyprus) and the Middle East (Lebanon, Jordan, Egypt, Kuwait, Bahrain, Qatar, Saudi Arabia, Oman, U.A.Emirates – Abu Dhabi and Dubai). Near by: In just 2 steps, you can find all the professionals, suppliers and services around your current location! Anywhere: In just 3 steps, you can find what you are looking for worldwide! 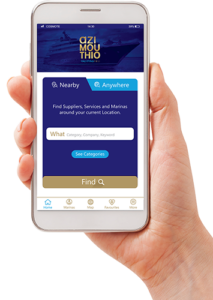 With over 10.700 companies in the yachting industry listed and 500 ports and marinas, we have endeavoured to make the AZIMOUTHIO Yachting Info App as smart as possible, simplifying the search for quick results. Our classification system breaks companies into a set range of categories, moves beyond this to giving search results in lists, and culminates in a word-recognition search bar, which offers results as words are being typed. Finally, AZIMOUTHIO Yachting Info App regularly updates its information systems and improves the speed of its operation, transmiting data at high frequencies. Hundreds of users download it daily and it takes up little memory. It is fast, easy to use, up-to-date and available on and offline! Professionals and enterprises trust the App for their advertising needs as visitors access the content in a fast and reliable manner. Available both for Android and iPhone devices. Guaranteed by the certification ISO 9001:2008 LLOYDS, for the quality of AZIMOUTHIO Yachting Info App and accuracy of the data. AZIMOUTHIO Yachting Info Smart Pack is a unique distribution service that is using our expertise and contacts to hand-deliver your marketing materials into the hands of the Yacht Owners, Captains and Crew. We have been distributing AZIMOUTHIO Yachting Info Directory and building relationships with Private Marinas, Ports and International Boat shows for 6 years now, so we have access to places and decision makers that no other companies are allowed to deliver to. Smart Pack delivered directly into the ready-to-buy hands of decision makers in yachting industry. Your Brochure or promotional material will be found around the yachting world through the Smart Pack, as AZIMOUTHIO Yachting Info promotes the Directory at international Yacht Shows and Events. We can also create a customized package for your special needs and hand-deliver your marketing materials where you want them to be. 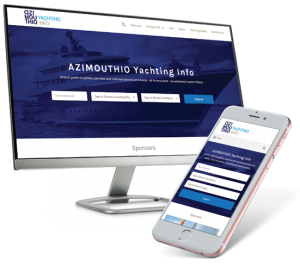 The AZIMOUTHIO Yachting Info Smart Pack is a service that enables professionals to distribute their advertising materials, in the most important international boat shows that we participate as exhibitors. AZIMOUTHIO Yachting Info, once more, has found a smart way to access yachts docked at the marinas or even at anchor, at a time when their owners or captains are relaxed and have enough time to spend reading your marketing materials. 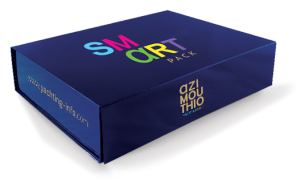 AZIMOUTHIO Yachting Info Smart Pack hand-delivers your marketing materials into the hands of the Yacht Owners, Captains and Crew. * Printed material to be supplied by the client. AZIMOUTHIO Yachting Radio is the first exclusively Yachting Radio worldwide. It was launched in 2016 to bring emotional lounge music to passionate yachting fans around the world. We listen and look at the spiritual contents in music. Our channel selection includes curated selections from the world’s most renown composers, a variety of chill out periods, lounge music and favorite instrumentals. We find the best music in each style and create the ultimate music program that bring listeners the music they want to hear. The point is that we are looking for in music is to capture feelings, emotions and memories. Like you, We enjoy music. That’s why our enthusiastic listeners can enjoy all of our music for free, without advertisements or any other interruptions.